After dominating the spring box office with Furious 7, director James Wan is returning to his horror roots next summer with The Conjuring: The Enfield Poltergeist. Production wrapped earlier this month, with the filmmaker currently in post-production, although it isn't known when the first trailer will arrive. To tide fans over before the new footage hits, Entertainment Weekly has debuted a first look photo from the horror sequel, which offers our first look at Madison Wolfe as Janet Hodgson. The Conjuring 2 is based on one of Ed Warren (Patrick Wilson) and Lorraine Warren's (Vera Farmiga) most famous cases, the 1977 haunting experienced by a single mother, Peggy Hodgson (Frances O'Connor) and her four children (Madison Wolfe, Lauren Esposito, Patrick McAuley and Benjamin Haigh). The paranormal activity took place between the years 1977 and 1979, at the Hodgson house in Brimsdown, Enfield, England. Some have claimed the haunting was real, while others believe it's fake, but director James Wan revealed that the case is among the most famous in history. Earlier this month, a new report surfaced that revealed this horror sequel may also be connected to another famous haunting case, The Amityville Horror. Actress Alexa Najera was asked on her Twitter page if she is playing Dawn DeFeo, one of the original murder victims along with her sister Allison, brothers John and Mark, and parents Ronald and Louise. While the actress didn't specify a last name, she revealed to the fan that she is playing Allison, fueling speculation that she is playing Allison DeFeo. One year after the DeFeo family murders, George Lutz and his family bought the Long Island house, but they ended up fleeing from the house after experiencing a number of disturbing paranormal occurrences. As it turns out, 20 days after the Lutz family fled, Ed Warren and Lorraine Warren conducted an investigation of the house. 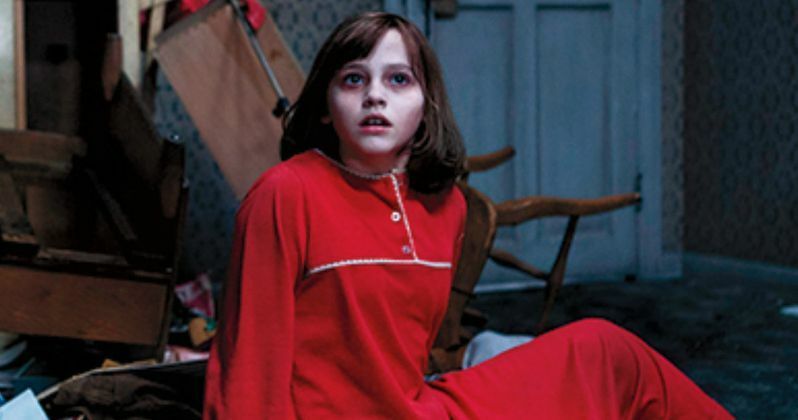 This connection to The Amityville Horror case in The Conjuring: The Enfield Poltergeist has not yet been confirmed. The Amityville killings took place in 1974, three years before the Enfield hanuting, and both cases occurred in different parts of the world, with the Amityville case happening in Long Island, New York, and the Enfield Poltergiest haunting taking place in England. Since the Warren's did investigate both cases in real life, it's possible there could be a connection there, but we aren't sure what it is yet. James Wan directs from a script by The Conjuring writers Chad Hayes and Carey Hayes. New Line Cinema has issued a June 10, 2016 release date, putting it up against Liosngate's Now You See Me 2 and Universal's Warcraft. While we wait for the trailer to arrive, take a look at the first photo from The Conjuring: The Enfield Poltergeist, and stay tuned for more on this thriller.